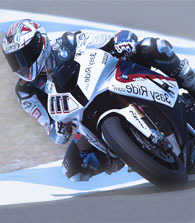 AEC-Q100 qualified MRAM memory from Everspin Technologies is helping BMW optimize performance of their 1000 RR Motorrad Motorsport Super Bike that made its international competition debut in 2009. In trials run prior to each competition, sensor data for fuel injection, ignition, braking and acceleration are measured and recorded in MRAM. Working from these data, the RSM5 engine control unit (ECU) can fine tune the bike to run at peak performance for the individual rider, specific track and exact race conditions that day. For critical data storage in the RSM5 engine control unit, BMW Motorsport selected Everspin’s MR2A16B Parallel Interface 4Mb MRAM. Used in the AEC-Q100 Grade 1 qualified option, the MR2A16B was considered rugged enough to operate within the very high temperature environments encountered in a motorcycle race, fast enough to read or write data in real time during a race, yet always be non-volatile, even if power is lost unexpectantly during the competition. MRAM is fast and non-volatile. Sensor data monitored in real time can be written in real-time without requiring load leveling or ECC overhead. An AEC-Q100 Grade 1 qualified MRAM will retain data for 20 years over the extended temperatures (-40 °C to 125 °C) found in under-hood applications. Unexpected power loss does not affect data integrity. Everspin’s MRAM technology is very robust and reliable over extreme temperature ranges, making it well suited to the demands of the automotive market requirements for memory products. Everspin is committed to the automotive market, offering a line of products that are AEC-Q100 qualified. This commitment extends beyond the technology and into each aspect of the requirements of this market including maintaining proper certifications, manufacturing excellence, long term supply, and continuous quality improvement. With MRAM non-volatile memory you can improve performance and reduce costs in virtually any automotive system. Read our Product Brief to learn more about how Everspin MRAM can protect your valuable data and reduce your BOM costs. The AEC-Q100 qualification standards, given in AEC-Q100, Revision G, are intended to determine that a device is capable of the required level of quality/reliability for the intended automotive application.